B-Raf inhibitor 1 dihydrochloride is a novel potent and selective B-Raf inhibitor. Takeda-6d has potent inhibitory activity in both B-RAF with an IC50 of 7.0 nM and VEGFR2 with an IC50 of 2.2 nM. 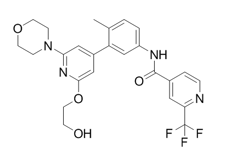 PF-04880594 is a RAF inhibitor, which induces ERK phosphorylation and RAF dimerization in those epithelial tissues that undergo hyperplasia. B-Raf IN 1 is a highlt potent and selective B-Raf inhibitor with IC50 of 24 nM; equipotent against c-Raf (IC50= 25 nM). HA15 displayed anti-cancerous activity on all melanoma cells tested, including cells isolated from patients and cells that developed resistance to BRAF inhibitors. BGB-283 is a novel and potent Raf Kinase and EGFR inhibitor with IC50 values of 23 and 29 nM for recombinant BRaf V600E and EGFR, respectively. CCT196969, a pan-Raf inhibitor, inhibits B-Raf with an IC50 of 0.1 μM.